I decided to take myself down to Exeter for the rearranged midweek evening match between Exeter and Wycombe Wanderers. I had in my mind that Exeter wasn't all that far from where I live in Gloucestershire. I did however change my mind after the long drive. That said, it wasn't as far as for the fans coming from Wycombe. As I entered the stadium there was a sign thanking the Wycombe fans for the miles they had travelled to be there. This error fortunately didn't mean I was too late for the pies. There was just a handful of fans in the Wycombe end hence demand wasn't very high. They had chicken balti or steak & kidney for £2.60. The guy at the kiosk was friendly and quite interested in our pie quest. He did try and claim that these pies were from a local bakery called 'Shauls'. 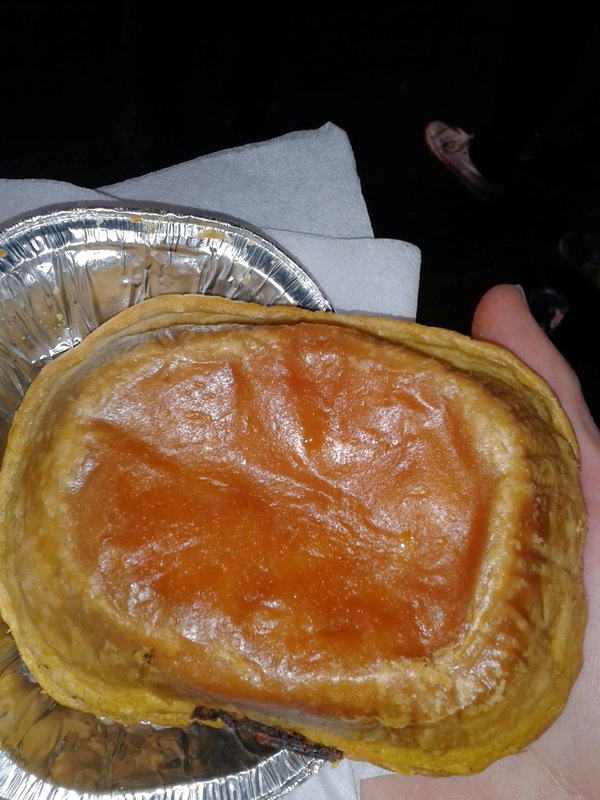 But the packaging said otherwise, they appeared to be none other than Shire's Famous Pies as we have reviewed before at Walsall. I stood and ate my pie in the inspiring away terrace. Basically this is a few concrete steps with no roof, thankfully the weather was okay. I normally really like the atmosphere at away games but the terrace was a bit sparsely populated for my liking. The game was entertaining though with Wycombe getting three points thanks to a spectacular effort from Max Kretschamer. Those 3 points proved to be vital to Wycombe as they stayed up on the final day of the season. I was glad I went to the game. I had a strange feeling that I had to see more Wycombe games last season. After having been a season ticket holder for many years I find it harder to get to Wycombe games these day. I generally haven't minded being a fan from afar. But with Wycombe battling against relegation out of the football league I felt it was a sense of duty for me to get to more games. It was as if I felt that my presence would somehow help them stay up. It was true that out of the six games I went to, I didn't see them lose. Not bad for a team which only survived on the last day of the season on goal difference! There was also another motivation, it was another football ground to add to our football pie league. Currently, it is only a small league of 7 clubs. At this rate we will have done a Tom Dickinson and visited all the grounds by the time we are 81 so stay tuned to pierate.co.uk! But where did this pie end up in our league. See the breakdown of the score below. Just one final note, both Wycombe and Exeter are just a handful of fan owned clubs in the football league. Such a shame both of them are struggling with falling attendances. I am not sure what the solution to this problem is, I guess it comes down to loyalty of supporters, whether they are prepared to watch a team that isn't splashing the cash. One thing is for sure, the Pierate ship will continue to set sail to see the Blues whenever it can! Condition - 4.2 out of 7 - This really was a pie of two halves, from the top the condition looked decent, but the bottom was unappealingly burnt. Colour - 3.1 out of 7 - As with the condition, the burnt bottom of the pie let down the colour score, I thought the top could have also been more appealing, a bit dull. Cheapness - 4.5 out of 7 - £2.60 is decent for a League 2 match, see the BBC's price of football analysis. Capacity - 4.0 out of 7 - This pie had a good capacity for its height but the shallow shape and overhanging pastry lid meant it didn't have as good a capacity as some of the competition. However, it was well filled. Chewiness - 6.0 out of 7 - Slipped down an absolute treat, the pastry was nice and crumbly and crisp, despite being burnt. This didn't seem to be a problem when it came to actually eating the pie. Almost slipped down too easily if anything. Content - 5.5 out of 7 - There were some chunks of meat and a sauce which tingled the tasted buds rather than burnt them. I would have preferred something with a little more kick to it, such as the Pukka version. It also lacked the meaty chunks of the Peter's chicken curry. 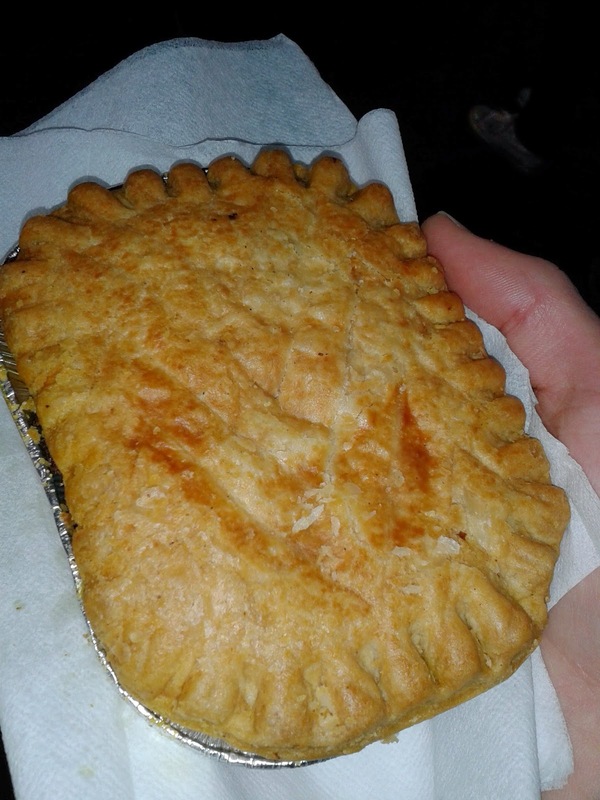 Consistency - 5.5 out of 7 - Had it not been burnt, I think this pie was more consistently good than the Peter or Pukka versions in that it didn't have a weakness (Peter's was a bit bland and the Pukka lacked meat). Shame about the condition or it could have score well. 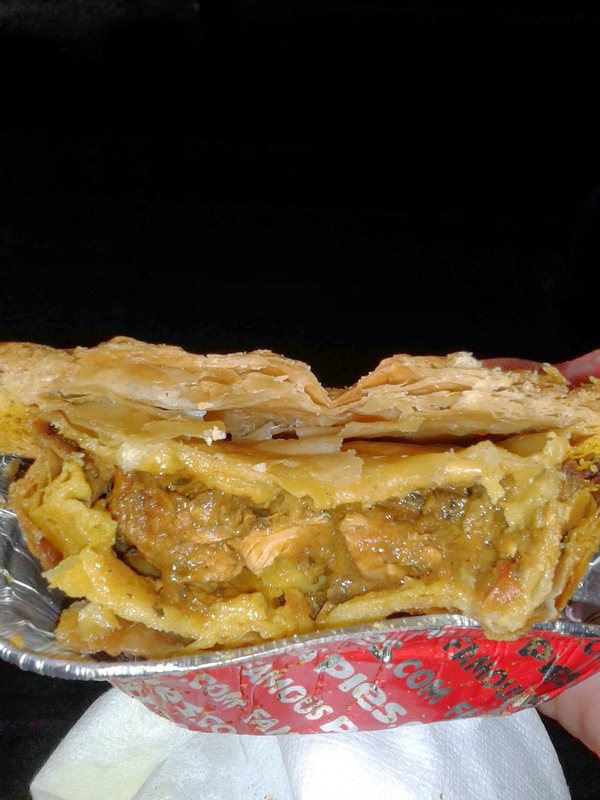 In terms of football curry pies, it is easy to see why Shire are so popular, this was great to eat in your hands whilst standing on the terrace and held together okay. A safe, middle of the road option.